FV Player's latest update (6.1.3) brings a couple of new settings that affect mobile devices, along with improved playlist subtitles and better control of how MPEG-DASH streams switch quality. There is a whole new section in Settings > FV Player > Setup tab called Mobile Settings. When turned on, this option will force player to load the native fullscreen on all mobile devices. This will result to losing all the FV Player's extra features like pop-ups, ads, speed buttons, AB loop or subtitles, but it will provide a faster and more stable interface for some of the devices. This option is actually turned on automatically for mobiles and tablets with older versions of OS (Android 4.4 or lower and iOS below 7). You can check how this function works in this demo - Mobile Native Fullscreen. Don't forget that you will see the effect only on a mobile device. Not so long time ago, forcing the fullscreen right after the playback started was actually a core setting for all iPhones and iPods. The iOS 10, however, made an end to this and the users of Apple mobile devices can decide if they want to watch videos in fullscreen or not. Some websites did benefit from this function, though, so we have decided to add an option to make the video start in fullscreen for all phones and tablets. We have a demo of this feature - Mobile Force Fullscreen. Check it on your mobile device to see how the player behaves. The playlist code structure is different from the code FV Player uses for showing single videos. Although we are currently working on a big overhaul to make the playlists more reliable and stable, we released a fix for those who need to serve playlists with multiple subtitles. You can use the shortcode editor to add subtitles to individual videos in the playlist. Check our guide How to Create Playlists to learn all about creating and editing playlists with FV Player's shortcode editor. 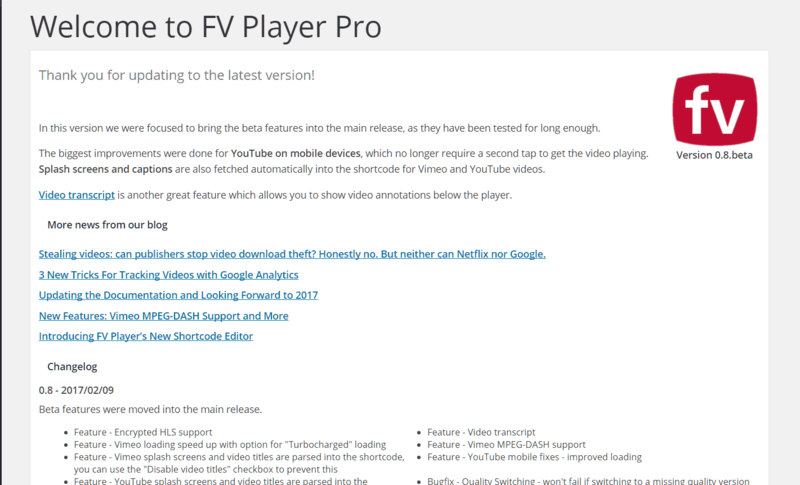 A couple of months ago, FV Player started to support the popular MPEG-DASH streaming format. Similar to HLS, this technology breaks the stream into chunks of data and serves them in order stored in an index file, while automatically switching between various qualities according to the network quality. You can read more about how it works in this article on our blog. MPEG-Dash had one small flaw - it tried to switch to the highest possible quality and the player considered only the network quality. This caused some problems on older computers as they weren't compatible with for instance the 4K format. We have made some adjustments in FV Player to make sure the quality switching also respects the screen size and also the size of the player. I bought the Pro version several days ago. I am trying to create a playlist where each video has multiple subtitle files (at least 2 different languages). While the short-code editor allows me to add multiple languages in the first video in the playlist, it only allows one language subtitle file in the second video in the playlist. Is there a way to add multiple subtitle files (for multiple languages) in all videos of a playlist? Or, is this something that you guys are currently working on for the next release? 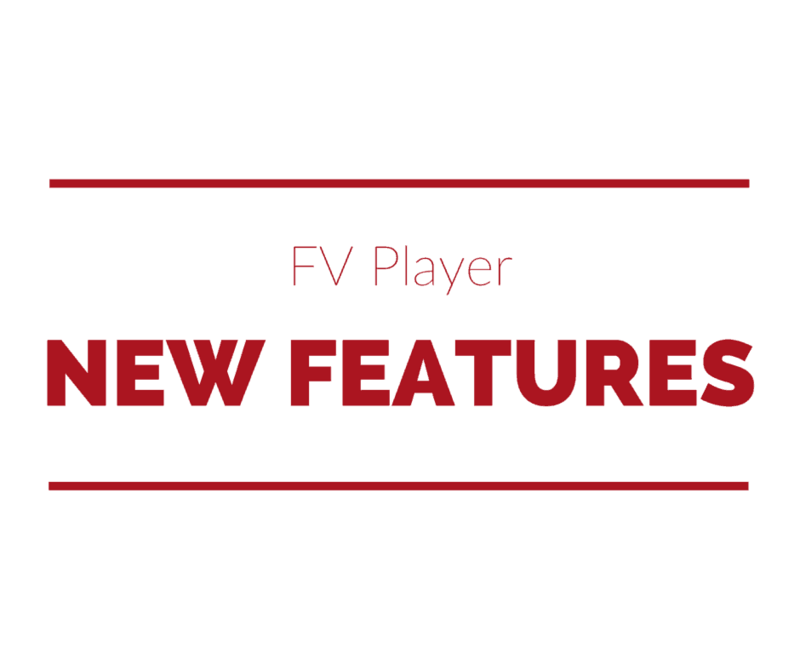 We have added multilingual support for the first video in a playlist just in the latest update of FV Player (version 6.5). We are currently completely re-working the playlist shortcodes, as the current shortcodes have more limitations. The new version should allow us to add support for multilingual subtitles for every video, not just the first one.